U Mobile is Malaysia’s most dynamic and innovative mobile telecommunication service provider that offers millions of next generation mobile consumers the freedom to “Live Connected”. Since 2007, the company has been constantly providing high quality mobile voice and data services with its wide distribution network backed by affordable pricing strategies. We’re a company that’s all about fun and we welcome new members to join and growth further with us. Launched in 2007, U Mobile is Malaysia’s fastest growing full-fledged mobile operator that offers data, voice and messaging services to its customers via innovative prepaid, postpaid and broadband plans. In less than 5 years, the company has grown its subscriber base from less than fifty thousand to over four million through its market-leading product innovation and value proposition. U Mobile opts for unconventional and game changing approaches to engage with its target segments, tailoring its product offerings according to consumers’ needs and lifestyles with a strong focus on youths and young professionals segments. Being the youngest telco and challenger in the dynamic Malaysia telecommunications industry, U Mobile has introduced many first of its kind services to the market. The telco was the first to offer the Unlimited Mobile Internet (UMI) proposition with voice, SMS and data in a single package for prepaid customers. The company also offers free Internet Roaming for both prepaid and postpaid in 9 countries making data roaming extremely affordable to Malaysian customers. 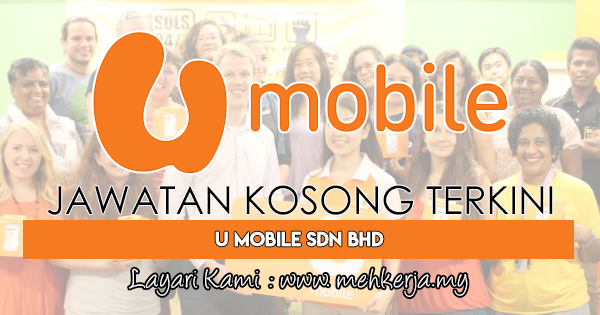 0 Response to "Jawatan Kosong Terkini di U Mobile Sdn Bhd - 16 Sept 2018"